Home › The Loop › What Are We Missing? 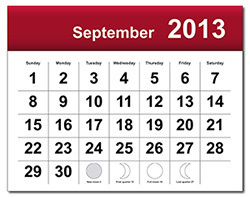 Did you know that September is "Attendance Awareness Month"? Now, granted this is an initiative designed to help keep children in school. However, we might as well take the same month out of every year to grapple with issues of absenteeism and presenteeism in the workplace. It seems that these learnings can apply to absenteeism and/or presenteeism in the workplace as well. Barriers are easy; we all understand that employees take sick leave due to illness or because their car breaks down. These common reasons for absenteeism are generally – and legitimately – covered by PTO. "Myths" might be an issue for which employers can be more proactive in combating. For instance, does your company have a written attendance policy, and is it easily accessible? If it's posted on the bulletin board in the break room, for example, employees can review it while concocting a plan to miss work for a specific reason, like to tailgate all day before a Springsteen concert. One of the myths you may be able to address is that an employee's work doesn't matter enough to the company, so taking a superfluous day off is no big deal. Each employee's workload should be carefully evaluated by direct managers to ensure that no one is too important that they can't take legitimate time off when they get sick, and that no one is too insignificant that frequent absences have no impact on productivity in the workplace. Furthermore, does your attendance policy explain that excess absences could potentially lead to more than just lost wages? For example, taking more days off than allowed could also factor in to fewer opportunities for advancement. By detailing examples of how missing work can impact job performance, you may be able to curtail gratuitous absences. The reality is that presence is important not just to get the work done, but to reinforce the perception that each employee is a vital member of the team. That perception can be lost if the employee misses too many days of work. Then there is the issue of aversion. We may not think of going to work each morning in quite the same way as going to high school, but some employees may get that same panicked feeling as does a student who's being harassed by a bully at school. If you have employees who tend to be overly critical, constantly annoying, or physically invade other people's personal space, this can create an atmosphere where coworkers dread coming to work. And whether they show up or not, being consumed by fear or aggravation can lead to presenteeism: the absence of intellectual focus on what they should be doing. In some cases, presenteeism could be even worse than absenteeism, such as causing injury at work. At very least, not being fully engaged leads to lower productivity. After all, we want our employees to work. We'd like them to be happy and look forward to each new day. If we take a page from the book of academia, celebrating a month of attendance awareness can help identify reasons why employees miss work. However, at least one academic believes that clever campaign ads won't help address attendance issues. Claire Smrekar, an associate professor of education and public policy at Vanderbilt University, called this year's school ad campaign "a very limited approach to a very complex issue." She suggested that the campaign would be more effective if it focused on stronger relationship building by teachers and mentors on a school-by-school basis. This seems like good advice for the workplace as well.